Three years ago, the federal government, with the passage of the Every Student Succeeds Act (ESSA), shifted the responsibility for identifying and intervening in our chronically underperforming schools to the states. With a limited federal role, we must now look individually at all 50 states to understand how our nation is addressing the achievement gap. 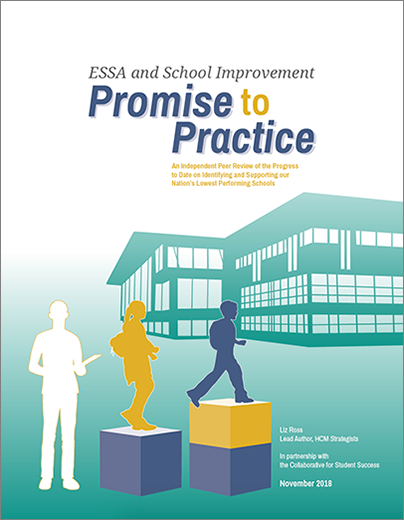 The Collaborative for Student Success (Collaborative) in partnership with HCM set out to identify and highlight the promising practices being adopted in the implementation of ESSA that were worthy of consideration by the field. This project, Check State Plans: Promise to Practice, is a natural progression from last year’s independent peer review conducted by the Collaborative and Bellwether Education Partners of every state’s new accountability plan, titled Check State Plans. In August 2018, HCM completed a four-month audit of state department of education websites to gather, at a minimum, the state’s application for districts to receive school improvement funding, the state’s scoring rubric for the application and the state’s guidance for districts or schools to develop and implement their improvement plans. Each of these documents represents one of the many tools states have to promote strong school improvement strategies. Ultimately, 17 states were selected for the review. Our report provides the field with recommendations from peer reviewers for states looking to do this work effectively. The states in our review have hit the ground running on their school improvement efforts, with varying degrees of success, and the remaining 34 have an opportunity to use Promise to Practice to ensure they are incorporating those best practices and including proven levers to improve equity and close achievement gaps. Our hope is that this review is a useful tool to state education leaders, educators, stakeholders and advocates as they grapple with the right leadership models, policies, and interventions to dramatically improve their lowest performing schools. In a noisy political environment that changes daily, this is one equity gap that if given the prioritization, rigor, energy and resources it deserves, could be closed.